In a compelling analysis of the factors that affect how much the ocean will rise along California's coast in coming decades, a seven-member team of experts led by UC Santa Cruz geologist Gary Griggs has issued a report on the best-available sea-level rise science. The report includes recent scientific advances on the role of polar ice loss and new information on the expected sea level changes that will occur based on different greenhouse gas emission scenarios. For example, with very successful mitigation efforts, the report states that there is a 67 percent probability that the Bay Area will experience sea level rise between 1.0 foot and 2.4 feet by 2100. However, if no significant mitigation efforts are taken, that range increases to 1.6 to 3.4 feet. The report also emphasizes the importance of preparing for extreme but uncertain scenarios involving the rapid loss of the Antarctic ice sheet, which would have an enormous impact on coastal regions. In one such scenario, sea levels along California's coastline could rise up to 10 feet by 2100, about 30 to 40 times faster than sea-level rise experienced over the last century. "Although our scientific understanding is rapidly increasing, waiting for scientific certainty about the rate or ultimate amount of sea-level rise is neither a safe nor prudent option," said Griggs, chair of the science team and professor of Earth and planetary sciences at Santa Cruz. "The sea-level rise projections presented in this report provide the scientific foundation for taking action today, preparing our coastal communities and mitigating hazards, and preventing much greater losses than will occur without action now." An estimated 75 percent of California's population lives in coastal counties. Sea-level rise, already underway, threatens hundreds of miles of roads and railways, harbors, airports, power plants, wastewater treatment plants, coastal wetlands, beaches, dunes, bluffs, and thousands of businesses and homes. The new science report was requested by the California Ocean Protection Council and the California Natural Resources Agency, in collaboration with the Governor's Office of Planning and Research, the California Energy Commission, and the California Ocean Science Trust. Expertise on the scientific team includes risk assessment, climatic change, ice sheet behavior, and statistical modeling. The science report will be presented on April 26 at a meeting in Sacramento of the Ocean Protection Council. The report provides the scientific basis for updating statewide policy, which guides state and local decisions along California shorelines. "California leads the way in both addressing climate change and protecting our coastal and ocean communities and resources," said Jenn Eckerle, deputy director of the Ocean Protection Council. "Our statewide policy on sea-level rise is another example of that leadership." The previous report, released in 2010 and updated in 2013, included a range of projections over various timescales, but did not estimate the likelihood that such levels would be met. The scientific team's new report includes information on the likelihood of specific scenarios and provides a framework for evaluating risk, adaptive capacity, and consequences from rising seas. This will allow local and state stakeholders to weigh the costs and benefits of taking action now against the potential harmful effects of inaction. 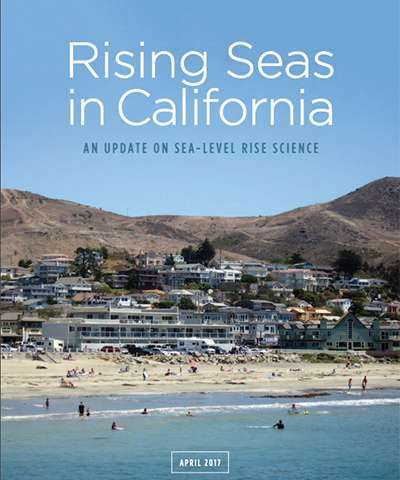 The science report will inform California's sea-level rise guidance document, which will help cities and counties as they comply with state law that requires them to incorporate climate change into their planning efforts. The updated guidance document will also assist state agencies prepare for and adapt to sea level rise, as directed by Governor Brown's April 2015 executive order on climate change. Public input will be integrated into the final guidance document update, which is scheduled for adoption by the California Ocean Protection Council in January 2018. The seven scientists who synthesized the latest science as a working group of the Ocean Protection Council's science advisory team are Gary Griggs, UC Santa Cruz; Dan Cayan, Scripps Institution of Oceanography; Claudia Tebaldi, National Center for Atmospheric Research; Helen Amanda Fricker, Scripps Institution of Oceanography; Joe Arvai, University of Michigan; Rob DeConto, University of Massachusetts; and Robert E. Kopp, Rutgers University. Scientific understanding of sea-level rise is advancing at a rapid pace. Projections of future sea-level rise, under high emissions scenarios, have increased substantially over the last few years, primarily due to new and improved understanding of mass loss from continental ice sheets. The rate of ice loss from the Greenland and Antarctic Ice Sheets is increasing. These ice sheets will soon become the primary contributor to global sea-level rise, overtaking the contributions from ocean thermal expansion and melting mountain glaciers and ice caps. Mountain glaciers contain enough ice to raise sea levels by only about 1.5 feet. In contrast, the Greenland and Antarctic ice sheets contain enough ice to raise global mean sea level by 24 feet and 187 feet, respectively. Although these ice sheets are not expected to melt completely, even on century or millennial timescales, the loss of even a small fraction of either of these huge ice sheets could have devastating consequences for global shorelines. For California, ice loss from Antarctica, and especially from West Antarctica, causes higher sea-level rise than the global average. For every 1 foot of global sea-level rise caused by loss of ice on West Antarctic, sea-level will rise approximately 1.25 feet along the California coast. After 2050, sea-level rise projections increasingly depend on the trajectory of greenhouse gas emissions. While model results have revealed the potential for high rates of ice loss and extreme sea-level rise during this century if greenhouse gas emissions continue unabated, the precise magnitude and timing of when the Antarctic Ice Sheet may begin to contribute substantially to rising sea levels is uncertain. It is clear that sea-levels are rising. As cities, counties, and state agencies make decisions about adaptation and hazard mitigation efforts, it is increasingly important to incorporate long-range planning for sea-level rise. Consideration of high and even extreme sea levels in decisions with implications past 2050 is needed to safeguard the people and resources of coastal California.